3L3 is a 2Watt dissipastion output pentode for battery radios, specified for 0.7 Watt output power. These are the highlight of the art of tube construction. I think nobody can make such tubes any more today, because they need only 50mA heater current. Same as an LED, but this heats a DIRECTLY heated tube! So better lnearity to begin with because of direct heating. These are real pentodes, so you can strap them triode mode to get a low noise, low impedance tube. Here is a radio circuit showing 82Volt Anode voltagem, and 7mA plate current. Best application: With such low voltage and current, they become totally IDEAL for building a battery heated phono amp or pre amp. Use rechargeable Lithium 18650B cells, with Zener diode +stabilisation, and one cell with run one tube for 24 hours. Data Sheet here. Pic1 - Pic2. Serialize 10 rechargeble 9V batteries for the Anode, and two tubes will run also 24 hours from those. So a battery operated, totally hum-free pre-amp can be made simple. 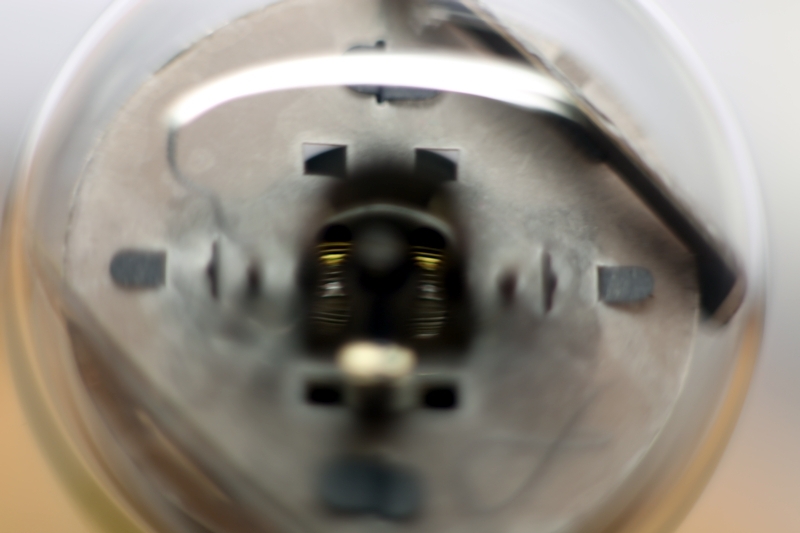 The 47 is a directly heated pentode, and it also has excellent triode characteristics. 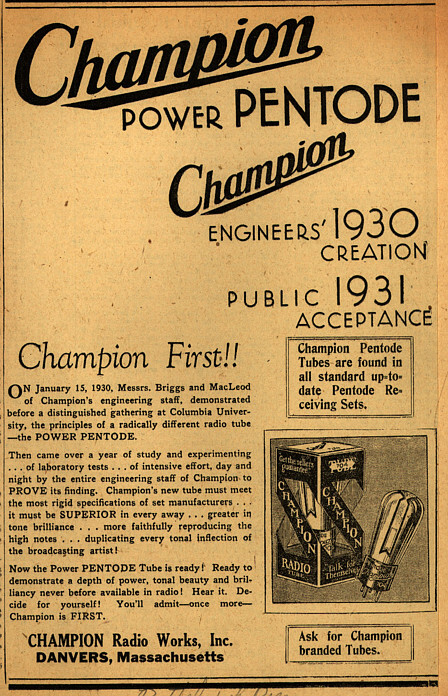 Not directly heated pentodes were made, because indirectly heated tubes were invented shortly after. 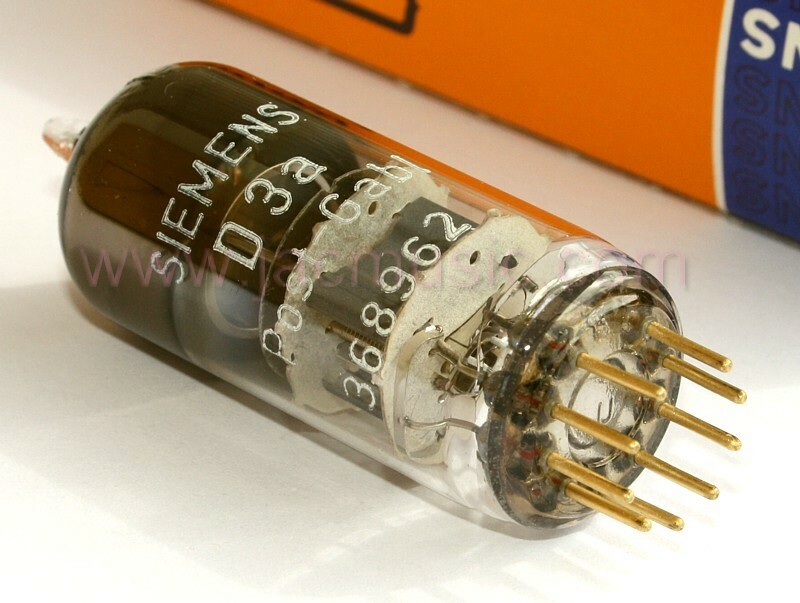 Though a pentode, such tubes can give beautiful vintage sound, as they are indirectly heated, meaning always better tube curves. 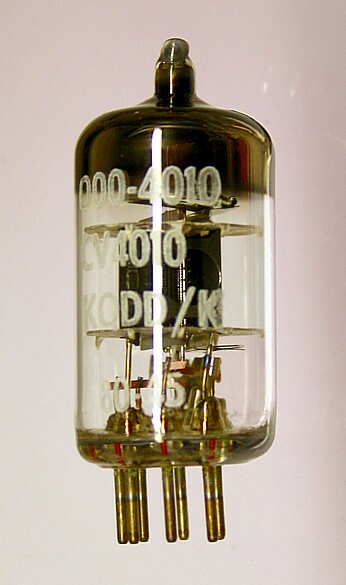 The 47 was the "big" output tube of it's time. It will produce 2,7 Watt output power in SE, at very comfortable 250 Volt only. It works very good in push pull also. I was able to get a lot of 22 pieces from somebody closing down his company. I never get such tubes again. Test results are wonderful. They come out of the boxes with shiny pins, and clean print, like new made yesterday. Even the boxes are perfect. 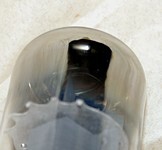 Beautifull black bulb, but not too dark, you can see inside very nice. General notes: 350B is an special version of 6L6. If you are interested in the difference, there is a great free source of information for this. It's the datasheets. We see there, the 350B curves remind of the 6L6, but they are not the same. The 350B is designed to work at lower voltage, and so it must work at higher current. To make the higher current possible, the heater current of 350B is much higher, thus giving more emission. The 350B heater is 10 Watt, whereas 6L6 has a 5 Watt heater. Also the glow picture of the 350B is very impressing, wow! 10 Watt is a lot of glow. What may seem so audiophile about the 350B is "the brand" for some users, but in fact we are dealing here with a large improvement of the 6L6. 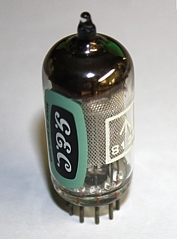 The 6L6 was "the" audio work horse tube for a long time. However 6L6 emission is a bit low, and curves not so great, but the tube was cheap and good. All WE had to do, is add more emission. This allows the lower working voltage, yet at lower distortion than the 6L6. 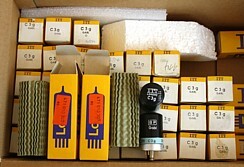 Sorry for the price, but it recently an unbelievable hunt for those tubes has started. This a truely mint condition NOS one, optical and electrical. So I can't sell it cheap. 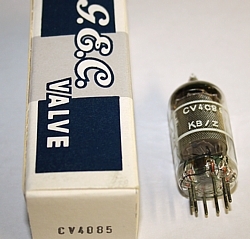 The tubes are stamped CV4010 which is the Mullard Designation for this tube. Mint condition, beautifull tubes. For Yamamoto phono amp, pre amp, or others. Used in Fender guitar amps. Russian designation is 6P3S. Supervb quality, that I have in originally sealed 50pcs boxes, and each tube is individually boxed. Cylinder glass, old fashioned construction. Extra stabile precision version, with all specs better than normal. Can be used at higher voltage. Tube bias tighter better specified. Wider range for filament voltage, and a lot more. This tube has a gold screen grid! I have not seen that before. Normally screen grids are graphite coated. Click the next two pictures to see that. Another NOS tube that is getting harder to find every year. Electrically equivalent to EF86, but octal based. 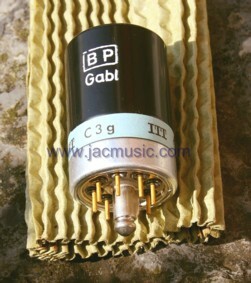 Ideal microphone or pre-amp tube, because of metal shielding, and low noise. Come out of the boxes like new. Lovely made smoked glass 6V6, with hand-blown tube base. So no machine made tube. Printed 6N6c, which is Russian for 6V6, they used other letters. 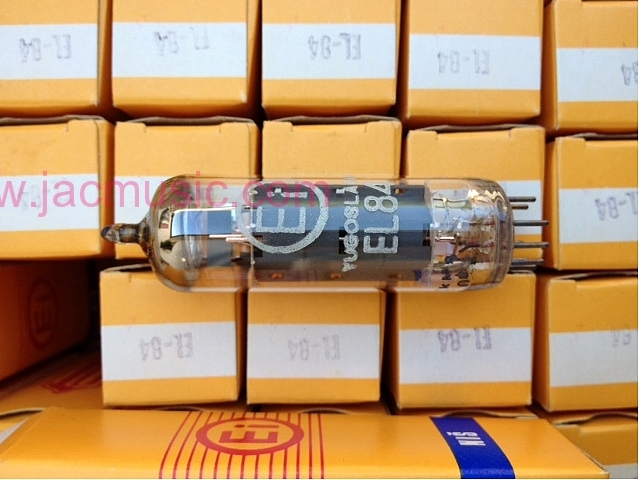 This tube is basically the older octal version of the EL84. 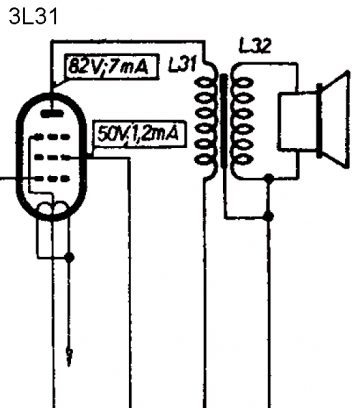 Use any EL84 schematic to make your own 6V6 amplifier, but also many 6V6 schematics are around. Why fight over the last remaining pieces of NOS EL84, while you can get this beautiful made version of this NOS 6V6 tube. Original colored boxes. VERY SPECIAL TUBE. 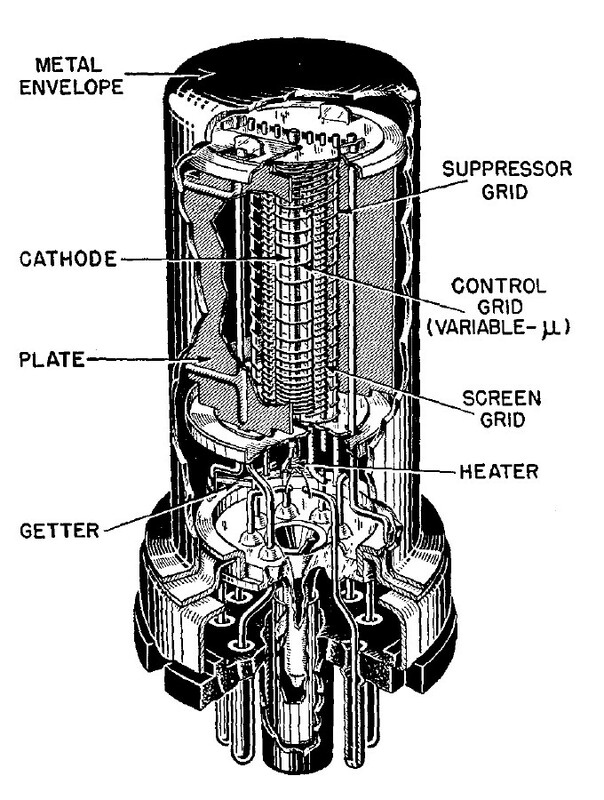 A real three grid pentode, no beam pentode like 6L6 or KT66. Can be seen as a kind of (better!) EL34, but with another socket and top cap. Electrically comparable, and can be fitted in most EL34 circuits, but it may need some minimal tuning to get the correct bias. So not fully identical. When looking inside, with a magnifier lens, I see the huge, flat cathode and.... clearly visible is the GOLD control grid. This is finest quality, it has lower distortion then normal EL34. The first grid is yellow color, second grid is gray, and third gird is white nickel color. So yes it's a gold grid version. Very potential audio tube. 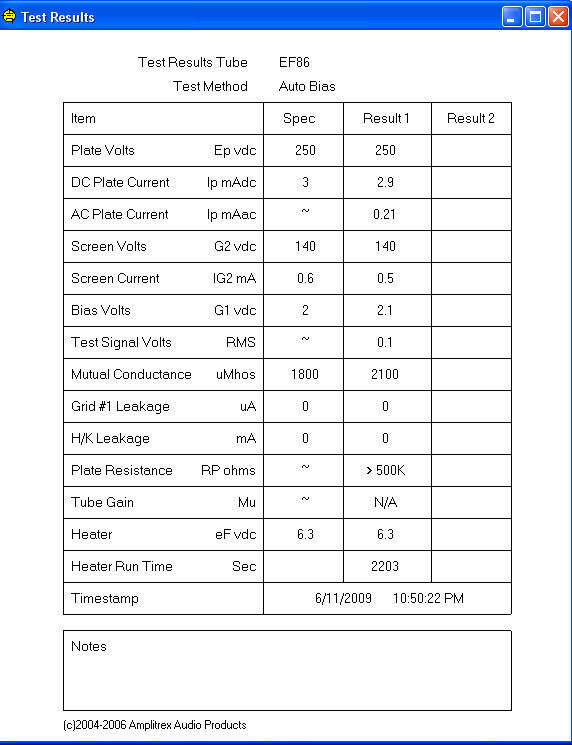 The schematic given here, shows 64 Watt in Push Pull. NOS black material Sockets are available, or gold plated Ceramic sockets from Yamamoto Japan. Made by Raytheon, for Western Electric. 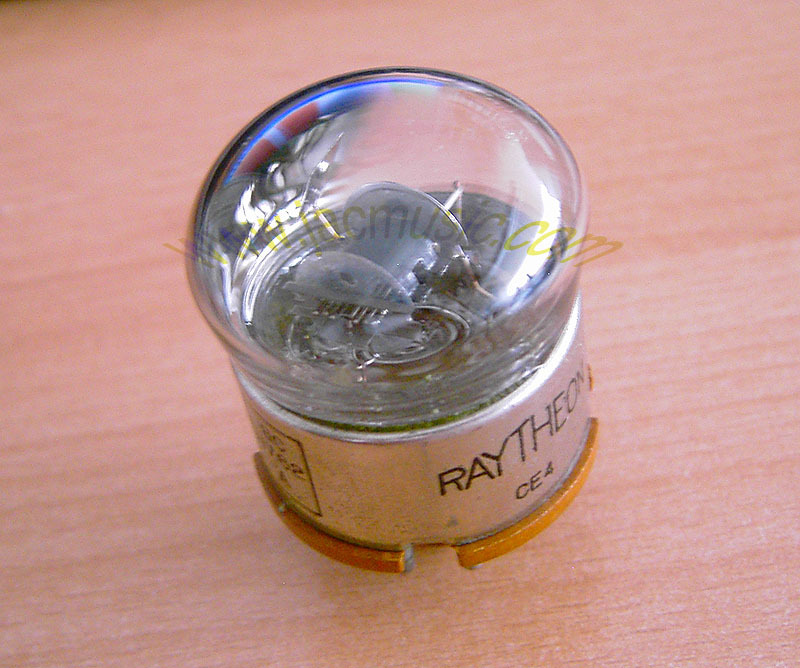 On the box front is Western Electric, and on the box side and tubes is written Raytheon. Out of the box came came one the nicest C3g versions I have ever seen, and the Lorenz (Stuttgart, Germany) brand has an excellent reputation. The tubes are individual numbered on the tube top, and have a nice, blue paper roll on it. They come out of the boxes crispy and new, as made just yesterday. 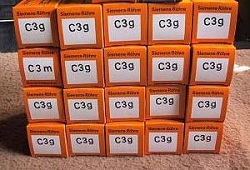 I had an excellent contact who digged up C3g and C3m tubes. He was related to sales of those tubes for many years and so he knew the quantities, and the buyers. He contacting the original buyers, when he was retired. He was lucky several times to find old stock that way. This is why I have all those brands and versions. He told me there is really nothing left to find any more at OEM customers, not at the post, not at others, just nowhere at all. There were many, on wooden palettes. They greater part of those went to Japan, and I kept a small stock for myself. So what we have for sale here is a depleting stock, and prices may rise. Before stock cleaning of the German Post began in 1995, C3g was more expensive as NOS 2A3. 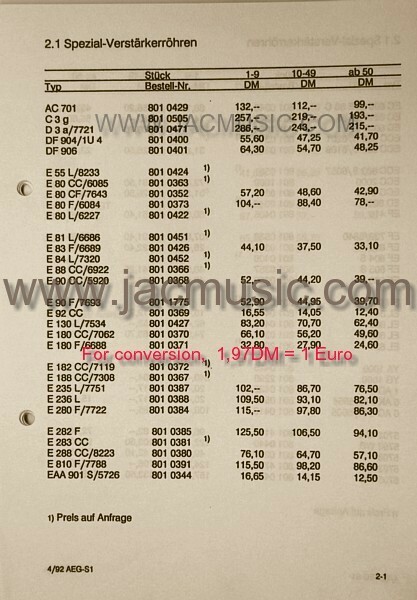 From 1995...2000, 10's of thousands C3g, and C3m were sold for scrap prices by the German post. This may seem many tubes, but it is not. With 20 tubes per person, 10.000 tubes is just 500 persons. Just because they came all at once, this reduced market prices extremely, and people thought C3g was now cheap for ever. So, many HiFi lovers, and companies jumped on this wonderul, yet so cheap tube. As demand rised, no new NOS stocks were found any more. Related to the price of 40 US$ in 1995, todays prices of C3g should be much higher. All tubes that cost 40$ in 1995 are now worth 2...5x more. So one way or another, I expect this is going to happen to C3g as well. Just wait and you will see. They were going for 14 Euro in 2005, then 25 Euro in 2010, and now as I wrote this in in 2015, 50 Euro. Which is actually just 1995 price level. So prices are expected to rise further in the years to come. S-Version with selected parameters. The S-Version is more tighter to the datasheet. My measurements have verified this is indeed so. Quantities of 50 pcs are packed in sealed 50pcs boxes. 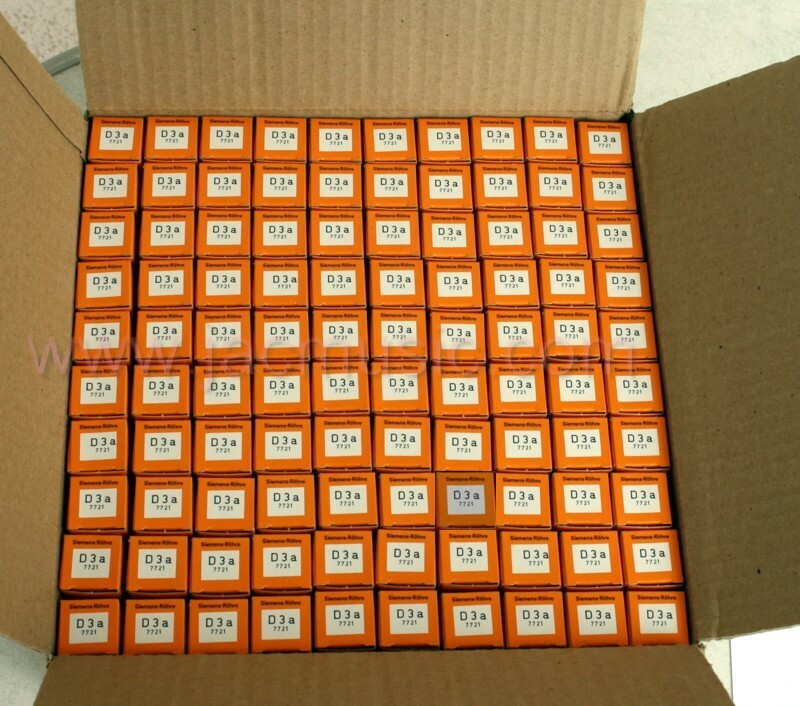 Inside are individual boxed tubes. 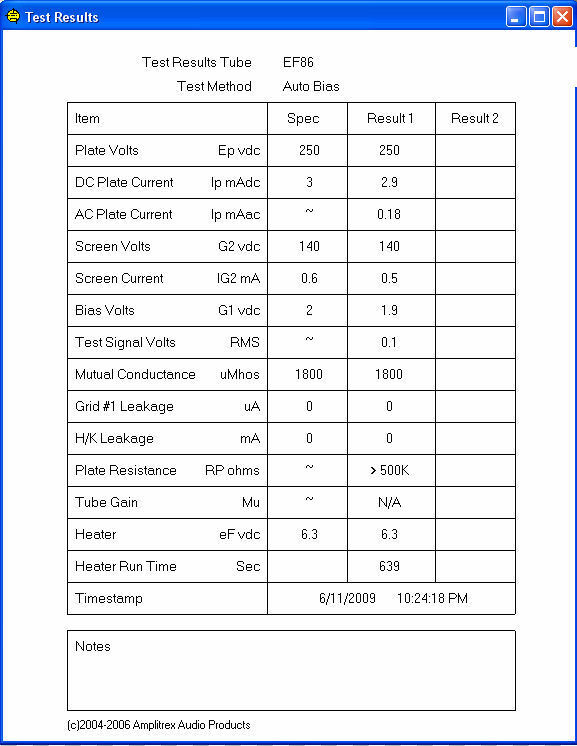 Get a 16 page data sheet from out website, go to techcorner and click to "scanned Data sheets". One of the BEST (?) 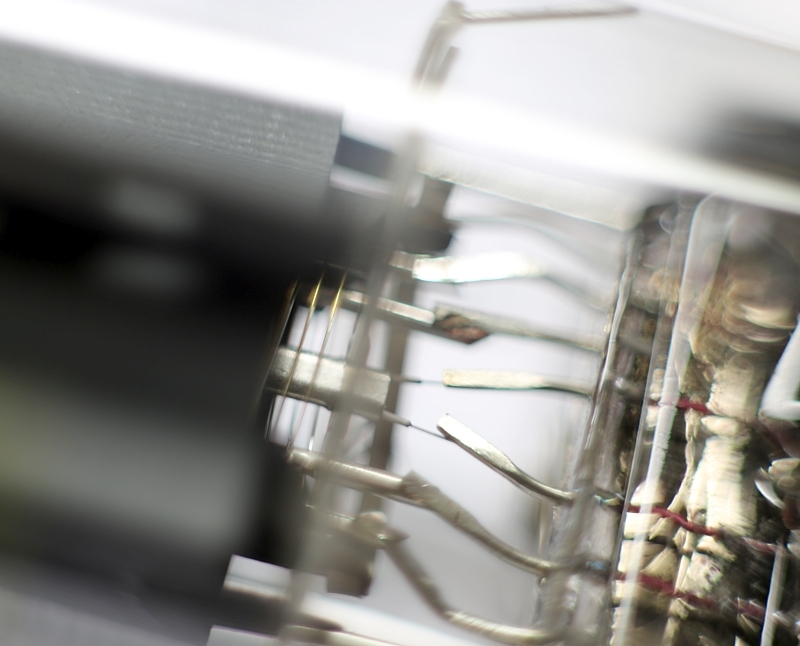 low noise audio tube ever made. Ideal phono tube. Low noise like a triode - amplification of a pentode. With very nice TFK Logo engraved on the top. One of the finest low noise audio tubes ever made. Ideal phono tube. Low noise like a triode - amplification of a pentode. 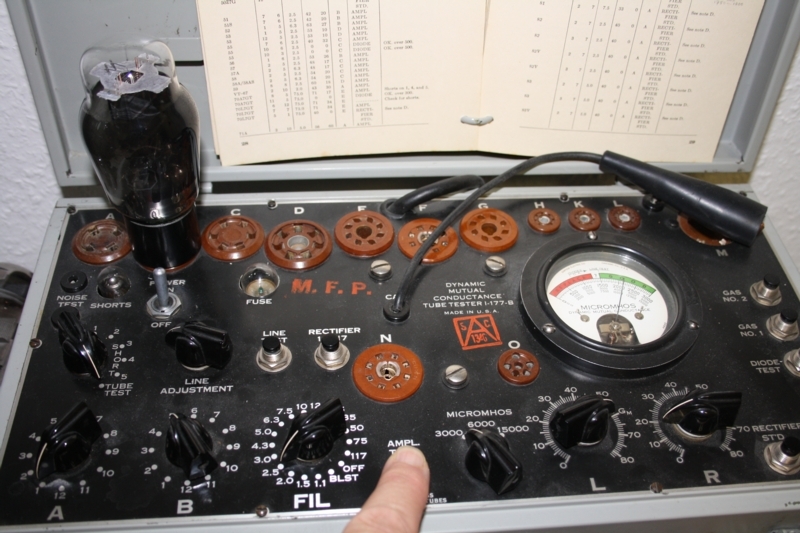 Most tubes are in military boxes, with date code, and Siemens order numbers on it, etc. This is another fabulous tube, like C3m, C3g, etc. It can be used pentode or triode mode. Triple Mica Version, gold pins. These are from a lot made by AEG Telefunken ULM, for Siemens. I can tell because I bought this lot directly as surplus. I have those in original sealed 100 pcs. master cartons. Each tube individually boxed. This is a FRAME GRID pentode. Extremely rare with tubes. 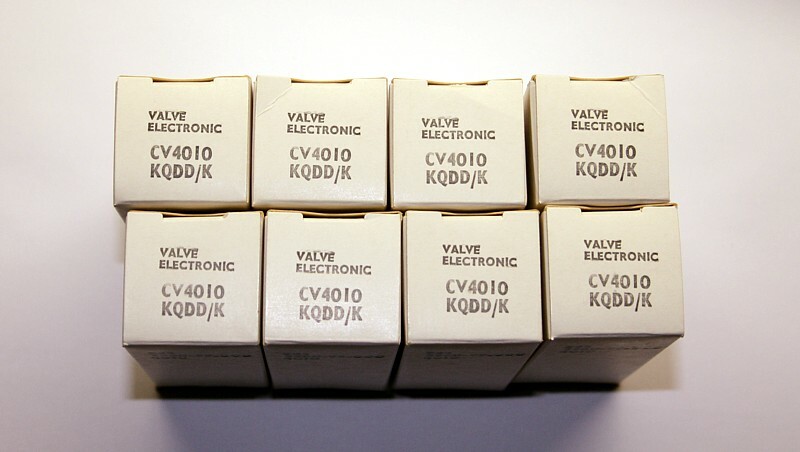 So use it as a very high gain pentode, ideal for Moving Coil amplifier, or others that need lowest noise. Yet it can do high voltage as well. I have even seen it as current source in a mu stage, very successfully. Normally, a pentode if connected as a triode will have unlinear curves, so they are not made for that. Not so with D3a! 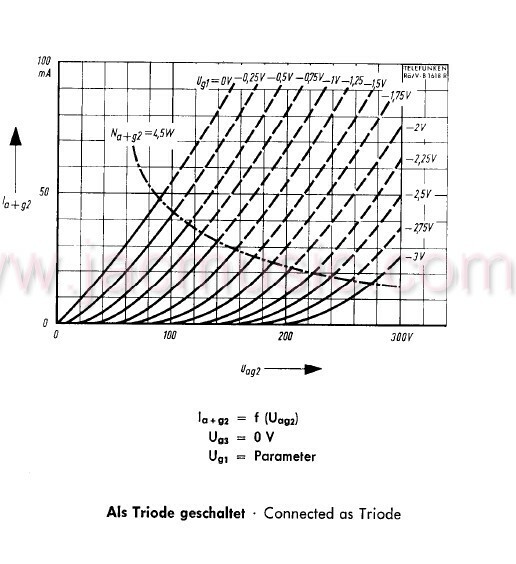 Truly amazing, excellent original triode curves are published. 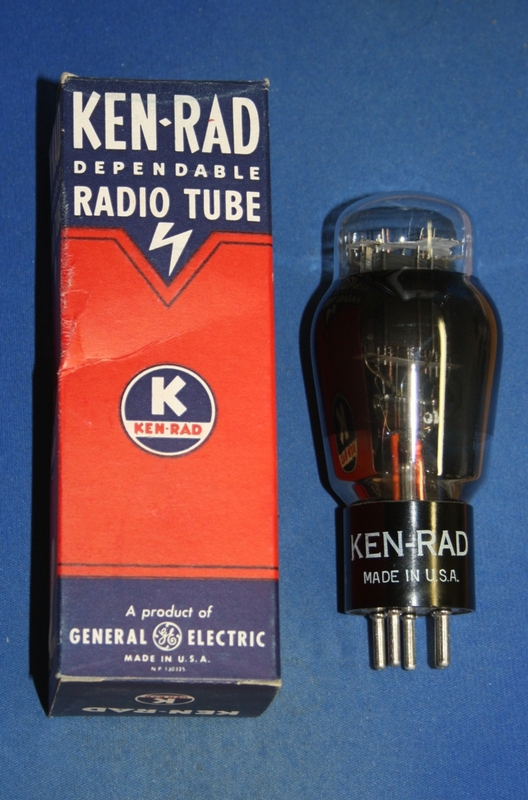 When you choose the recommended operating point, the curves are very linar, and in triode mode this tube has a gain of 77x. How about that gain?! 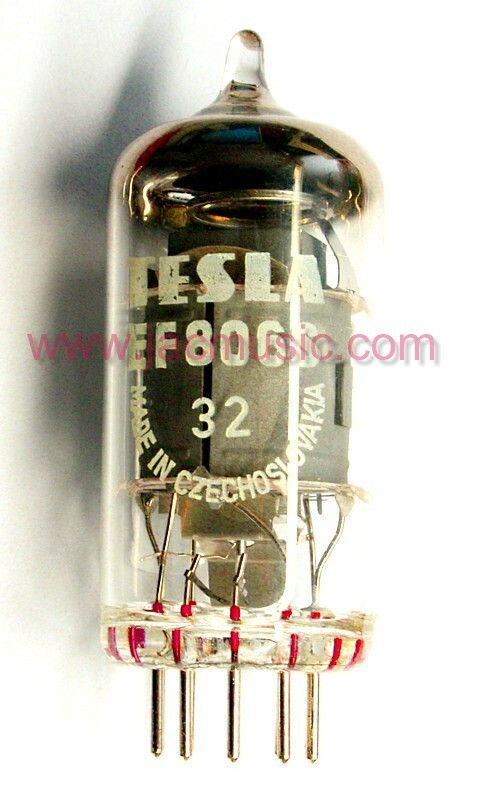 From the family of ECCxx tubes, I only find ECC83 which can do so, but ECC83 is very high impedance, and ECC83 gold pin NOS is expensive. D3a will give a gain of 77 at much lower impedance. So you see, this tube is really a first class product. 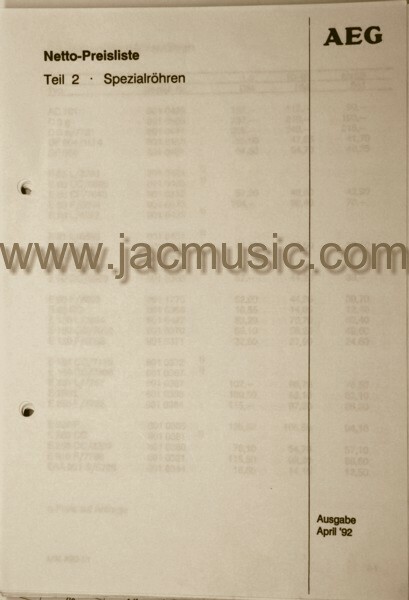 I have an original old pricelist. D3a had a factory price of 286DM one. That is 145 Euro. 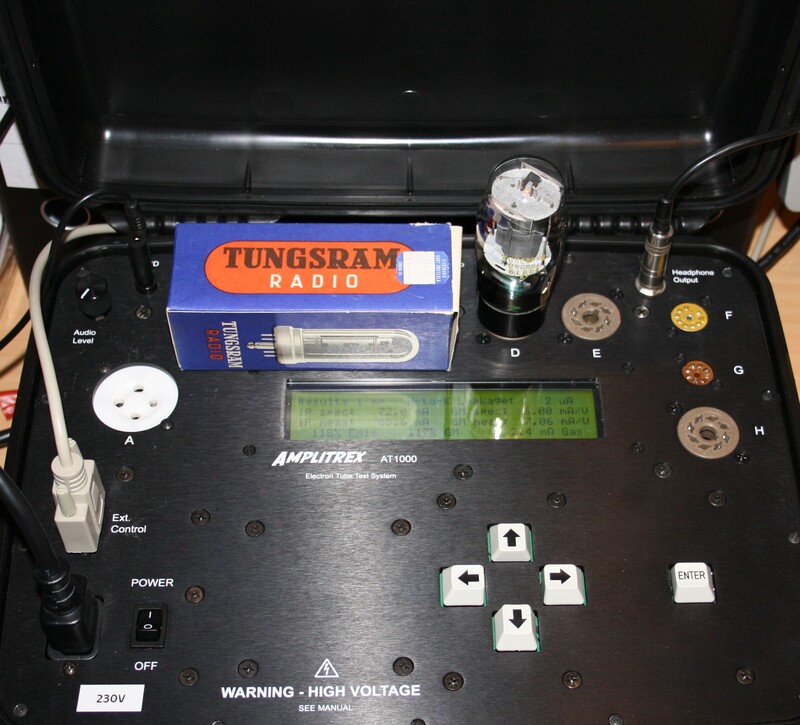 The factory was EAG Telefunken, and production was by them for Siemens. It was the most expensive small signal tube they made. Packed in original bag. 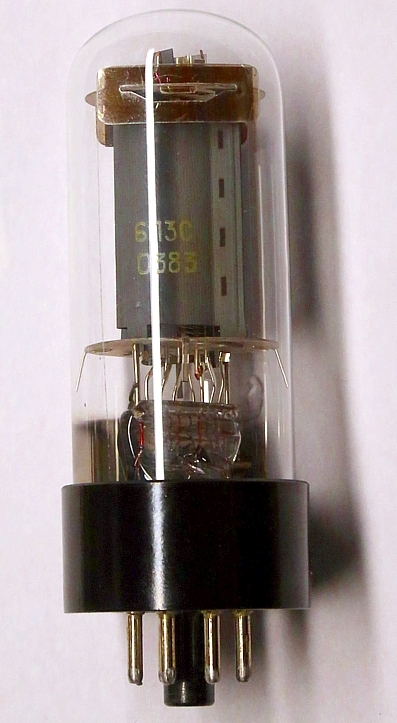 Beautiful Gold pin tube, also perfect in triode mode. 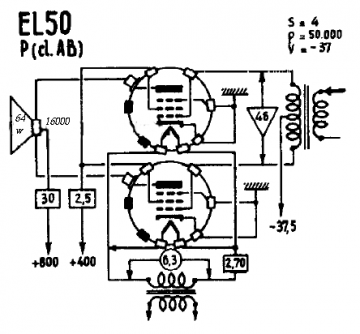 Triode gain is 50, and Rp =2k3. For this price you can't go wrong! 3 Watt tube, wide wite flat cathode, for superb best linearity. SQ 10000h tubes, very tight to the specifications. 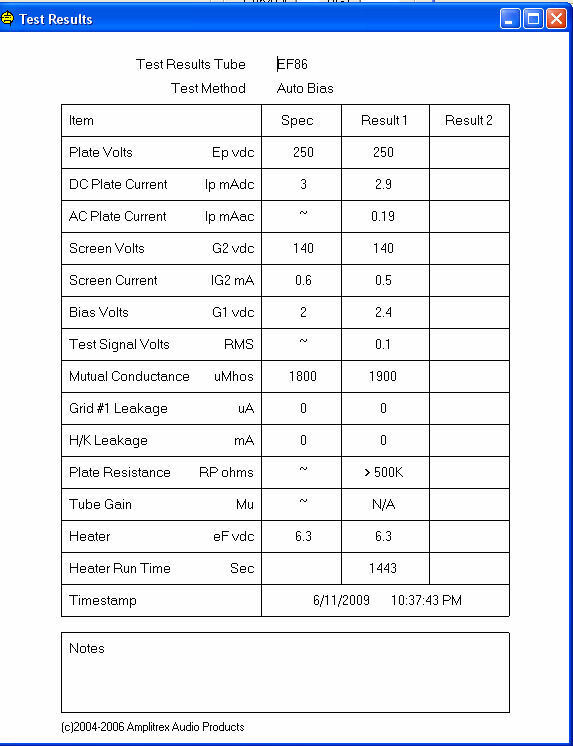 Philips datasheet here . Link to external website, with computer made curves here. Good printing, original box. Tests >100%. 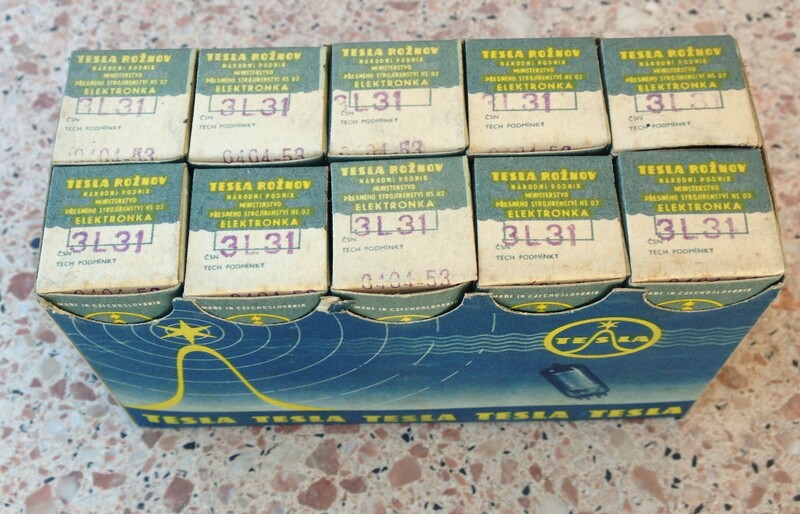 Telefunken NOS, Original box. With <>. Mint appearance. 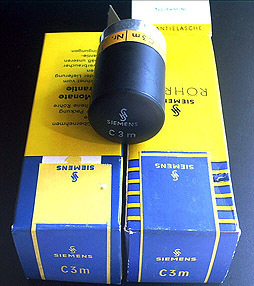 Siemens NOS, Original box. With <>. Mint appearance. Lorenz NOS, Original box. With <>. Mint appearance. NOS. Original box. No <>. With test data. Original sealed box. <> tubes. Never opened. Sold in cellophane sealed box "as is", or tested before shipment, whatever you choose. By G.E.C. Valve. England. This is one of the finest EF86 ever made. GEC never sold tubes in bulk pack without boxes, so for NOS, make sure you always buy them with boxes. Solid plate. Amplitrex tested. White box. Test data here. Mesh plate. Amplitrex tested. White box. Test data here. Original Blue Yellow Box. Lower box in picture. Left tube in picture. 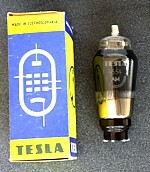 Original Black Yellow Box, tested with Tesla TECHNOMAT. Special red stamp on box for that. Original Blue Yellow Box. Upper box in picture. Right tube in picture. 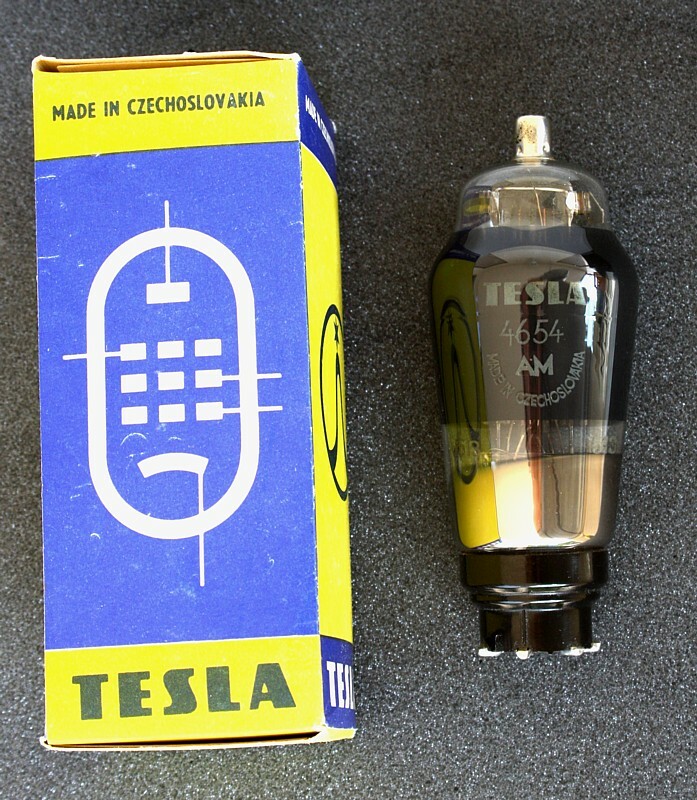 Tesla NOS tubes have been a forgotten treasure for a long time. Well, these days are gone. It is so funny to see how the old story repeats over and over again. When you can buy them in quantities, nobody wants them, and when they're gone, everybody must have them. I remember I could buy TESLA KT88 for only 20€, right from the factory. And nobody was really interested. (Oh, it's only a Tesla.. well, I can buy them another time) Now they're all gone, I get still get requests from people who remember it from 15 years ago, that I had KT88 original Tesla. Only unfortunately nobody has them for sale, not even for highest prices. The intermediate period, when they change from normally available to unavailable is always very short. So this is standard behavior for the NOS market, and I am convinced this will never change. With ALL TESLA small signal tubes, like E88CC, or EF86, EF806S, etc, etc, we are now in the transition period (from available to unavailable). Please read the above short story again, to know what the really means. 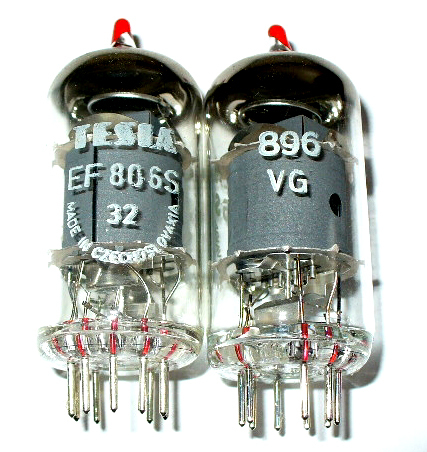 Collectors start now t buying those TESLA EF806S, which is identical to TFK EF806S, and Ultra High quality tube, low noise long life version, to replace EF86. 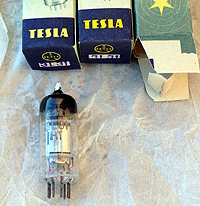 Tubes are in original Blue-Yellow Tesla boxes, with a quality stamp on the inside flap. The most amazing is the constant quality of them. They all have identical data. No leakage, no drift, just perfect tubes, each of them. Beautiful Quality. We never get this back again. 6N14-EB is a Special Quality EL84. This is NOS and the BEST EL84 ever made. Read here. Originally boxed. These need NO MATCHING. They come out of the original boxed MATCHED. Take any random four tubes, and they are a matched quad. This is quality from Russia! 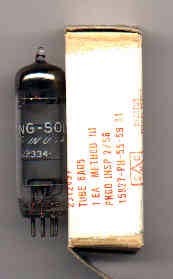 You like "another" tube than KT88.... try GU50 (similar to EL152). This is very powerful tube. It can do 40 Watt continious and , 55 Watt Peak. (Full data sheet here). Good printing, original box. Absolutely excellent Audio tube. Military NOS quality, no commercial tube like KT88. WE SELL THE SOCKET FOR THIS TUBE ALSO. They're lower cost and compared to GU50, KT88 is only a consumer tube. GU50 is extremely strong and very low distortion. Amazing quality Russian military old stock. Note: These can not directly replace KT88, because the bias setting is another, and also the sockets are another type. We can not help you with modifications, specially not when you have no idea how to do it. We can only give you the data sheet, and for if you know yourself how to do this. Well, it is easy to do for a specialist. The bulb is hard glass. It has Four (!) getters, and inside made from hard metal. You can hammer a nail in the wall with this tube. Much different from the fragile KT88. The metal piece can be removed from the top, using a hot air gun, like you use for hair drying. Bake the top, and the glue will get soft then, and brittle away. The bakelit tops you can srew off, and are even nice feet for a small amplifier, no joke, these are lovely made. 300B, 300B-XLS, 320B-XLS COMPATIBLE in Triode mode! This is the poor man's 320B-XLS. Apart from the socket, and 12.6V indirect heater, this tube in Triode mode can replace 300B directly, and most 300B-XLS and 320B-XLS applications as long as you stay below 40Watt continious. Please check the Triode curves! 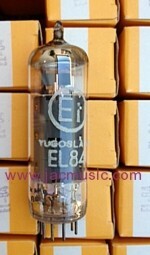 They are not just a "little bit" triode like, as you may know from KT88 or EL34 in triode mode. No... these are PERFECT triod curves, you may wish all power triodes were like that. Oh yes, and the price is very low. So take any 300B or 2A3 circuit, and there you go! What else do you want? !!! SECRIT TIP. Also used by Jean Hiraga. Mint condition, Original Box tube. Some boxes still sealed since 1940. 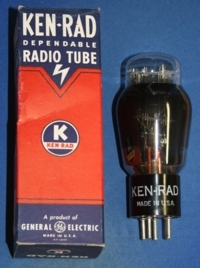 Original Box tube. On the glass it has "Made in Germany" and TFK Logo and Berlin datecode: B4004112. 1980's 11.5 Watt. Potential Audio type. Can be wired for 6,3V or 12V. Nice as driver tube with Lundahl LL1660 interstage. Optically like a 6H30 , but 12GN7A is a pentode. Probably triode connected it will give a great triode. Secret tip? 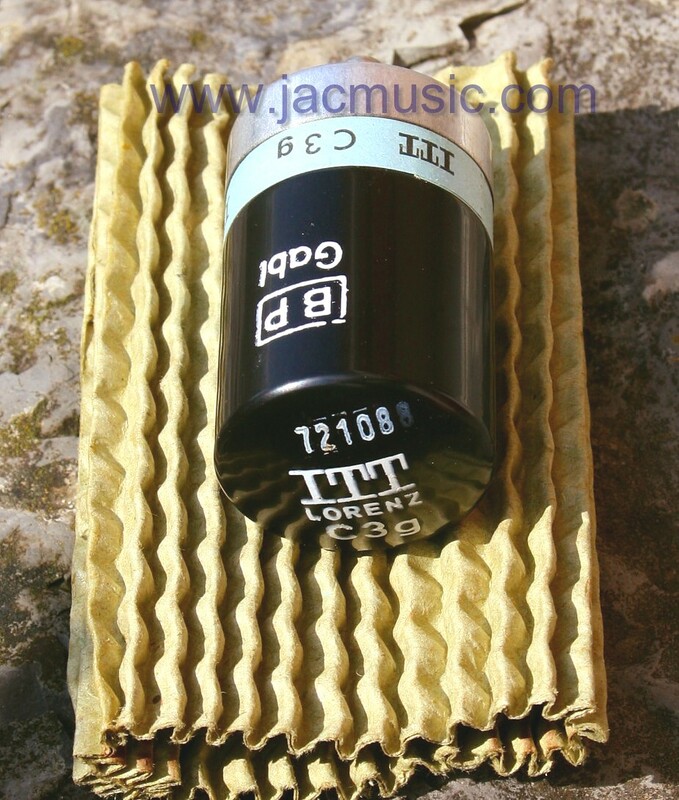 I had an excellent contact who digged up C3g and C3m tubes, by contacting the original buyers. He was lucky several times to find old stock that way. This is why I have all those brands and versions. He told me there is really nothing left to find any more at OEM customers, not at the post, not at others, just nowhere at all. There were many, on wooden palettes. They greater part of those went to Japan, and I kept a small stock for myself. So what we have for sale here is a depleting stock, and prices may rise. 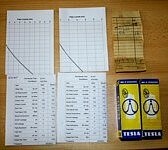 Tesla NOS tubes have been a forgotten treasure for a long time. Well, these days are gone. It is so funny to see how the old story repeats over and over again. When you can buy them in quantities, nobody wants them, and when they're gone, everybody must have them. I remember I could buy TESLA KT88 for only 20€, right from the factory. And nobody was really interested. (Oh, it's only Tesla.. well, I can buy them another time.... That kind of talk). Now they're gone, I get still get requests from people who remember it from 10 years ago, that I had them. Only unfortunately nobody has them for sale, not even for 100€ each. The intermediate period, when they change from normally available to unavailable is always very short. So this is standard behavior for the NOS market, and I am convinced this will never change.